APRS position reports (red pushpins) overlaid on GPS map of Peach Valley's Candy Cane Loop. The orange track is the GPS track. The pushpins come from post-processing an ARPS file collected via ham radio. Automatic Packet Reporting System (APRS) is a ham radio mode. It does many things. Here we look at the tracker mode. When I go motorcycling I carry a GPS receiver, a DeLorme PN-40SE. This web site is full of GPS tracks overlaid on base maps. However, I carry something else. 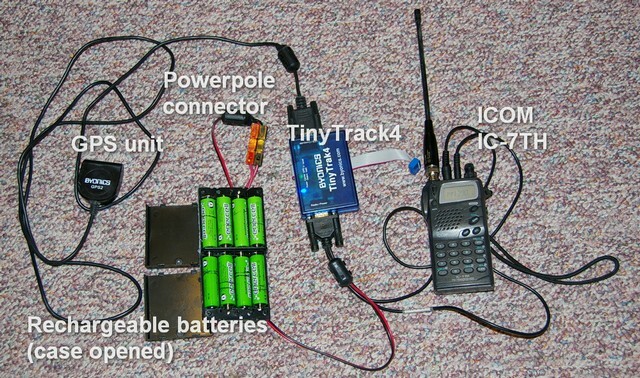 It’s called an APRS Tracker, and consists of an additional GPS receiver, a Terminal Node Controller (TNC, in this case a TinyTrak4), and a 2-meter handheld. The tiny little GPS receiver is mounted on my shoulder. In my vest I carry the TNC and the radio. Every two minutes it issues a digital report via ham radio that broadcasts my whereabouts, including position, heading, speed, and (as currently programmed) the battery supply voltage. Why is this of interest? Because it means anyone (and I literally mean anyone who has access to the Internet) can see where I am. When I’m off exploring the nethermost regions of some trail system, that’s a good thing. The GPS track above is of Candy Cane Loop in the Peach Valley area near Olathe, Montrose County, Colorado. What’s of interest are the red push-pins, inserted onto the map by DeLorme Topo North America. These mark locations at which two things happened: first, my APRS tracker issued a position report, and second, the APRS repeaters in the area picked it up and sent it on to the Internet gateway. From there it went to www.findu.com, which is where anyone can track me (assuming my tracker is turned on). I copied the raw data from the site, parsed it, and put it into Topo North America, resulting in the push-pins you see. Close study of the push-pins shows a couple things: 1) my signal is only picked up when I’m on ridges and have a relatively good sight line to a APRS repeater (there are several in the area), and 2) the data sent is not as precise (doesn’t have as many digits) as the PN-40SE data and therefore isn’t an exact representation of my location (but close enough). The lack of coverage is not surprising because 1) there aren’t all that many people out here in Western Colorado, hence repeater coverage is spotty, and 2) the Peach Valley riding area offers lots of trails that are deep down in ravines, not good for 2-meter ham radio, which is mostly line-of-sight. My little portable APRS station, tucked into my motorcycle vest, can be configured two ways. The first is as a tracker, meaning it only transmits my position data. That configuration is shown in the photo below. 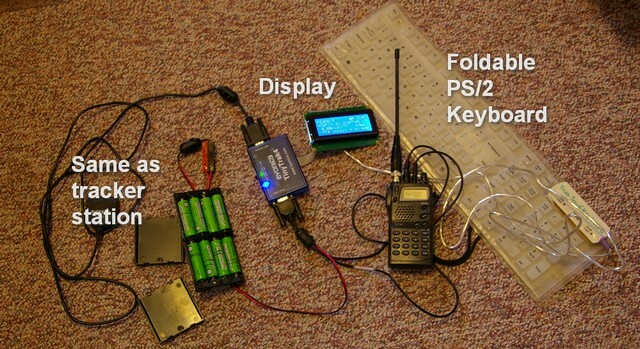 Adding a display and a PS/2 foldable keyboard results in a basic station which can both send and receive messages in addition to being a tracker. And, it picks up and displays positions from other nearby stations. Adding a small screen and a foldable keyboard results in a basic station that acts not only as a tracker, but also is able to receive reports from other stations, plus send and receive short messages. Here’s a closeup of the screen. Pretty rudimentary, but it works. 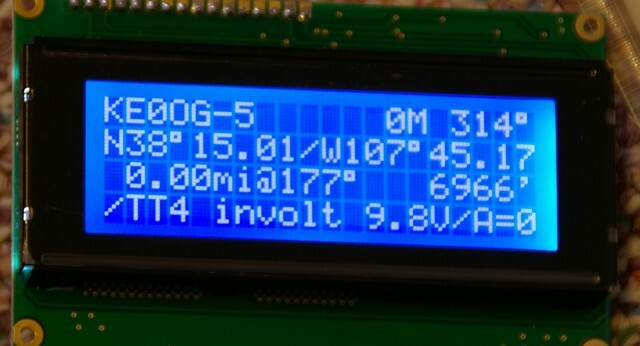 APRS basic station display unit, currently showing my basic station information as transmitted by the tracker, can also be used to send and receive short messages. So, there you are. The Byonics TinyTrak4 unit is basically designed to be a tracker plus has limited additional capabilities. The keyboard can be used to update parameters directly without having to connect the TT4 to a computer. It’s claimed it will run as a UI TNC, though I’ve not been able to make it work that way. It’s said that a future firmware update will turn it into a KISS TNC, but that remains future. One thing I can’t complain about is the price, currently $75 on the Byonics website, much less than other TNCs. You’ll note there are numerous options available with the TT4, including a matching GPS (which I purchased) plus various cables (which I purchased). Note that the TT4 will not work with USB GPSs, such as the DeLorme series. Note (and this is important) only keyboards that have native PS/2 connectors will work! Using a USB keyboard via an adaptor does not work (I’ve tried, believe me). Finding a foldable PS/2 keyboard proved to be a real challenge—I finally found one on eBay after a couple false starts. All new keyboards are USB. My major problem is that with all those cables and connectors, I really have to stuff things into a long pocket on my vest, and there’s no room for the screen and the keyboard. Someday I’ll figure out how to do that! I used Textpad to make the changes. I would normally write a BASIC program to do the conversion, but to my chagrin, GWBASIC does not run under Windows 7. I've found a free FORTRAN integrated development environment from Silverfrost that includes the Plato IDE, but I'm going to have to do some serious brushing up to remember how to do all the parsing and type conversions that BASIC makes so easy. This entry was posted in Ham Radio blog entries, Montrose County, Motorcycling, Product Reviews and tagged APRS, Byonics TinyTrak4, DeLorme PN-40SE, ham radio, Icom IC-T7H, making gps maps, TT4. Bookmark the permalink. concerning your “rechargeable battery” case and wiring. Did you you just cut the cigarette lighter end off, and use the same cable as Byonics sold? Just starting aprs, and found this and the uv-5r pages. I just found this site from your youtube channel. What a great collection of material–I’m looking forward to exploring it some more. I put together a simple tracker a few years ago using a Foxtrak kit. I finally got it working and tried it out on car rides. I also noticed how widely spaced the location updates were but it’s certainly helpful information. I’ve been meaning to try it by bicycle. I’ve picked up the Flying Broomstick part I again and am enjoying it–what a great way to explore the western slope without leaving home!